We linked his concept of poetry with a “voodoo” magic illusion for the visual aspect of our seminar. – Andre, Jay, and Josh. This entry was posted in Educated Imagination, Video on August 27, 2009 by Michael Happy. Northrop Frye attended C.S. Lewis’s lectures during the time he spent in Oxford in the late 1930s; much later he would recall Lewis as the only lecturer in Oxford worth listening to. The two men would not seem to have much in common: Lewis took a leading role in the revival of a consciously orthodox form of Christianity that is poles apart from Frye’s visionary Blakean Protestantism. 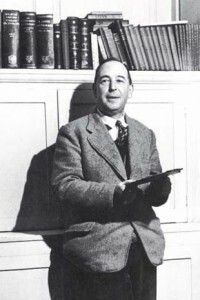 Nor does Frye seem to care for Lewis’s fiction: in the diary for 1949 he expostulates against Charles Williams, noting that “C.S. Lewis must be an influence too, & a bad one” (Feb. 26). The passage from the Anatomy quoted above, identifying the fiction of the Inklings with the formulas of the Boy’s Own Paper, is hardly complimentary. But the lectures Frye heard at Oxford were later published as The Discarded Image, a study of medieval cosmology that outlines a “Model” that persists until the end of the seventeenth century. The affinities with the cosmological schemes in Frye’s work are readily apparent. This entry was posted in Anatomy of Criticism, Oxford on August 27, 2009 by Russell Perkin. 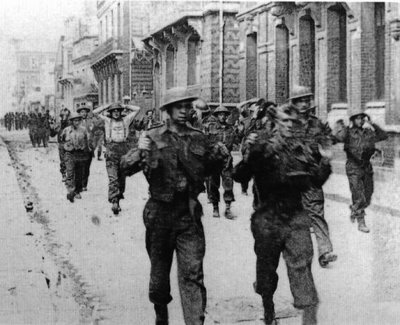 1942: The recent Dieppe raid, which was soon to be an acknowledged disaster, continues to preoccupy Frye (Canadian prisoners pictured above). I resolved today to (1.) keep up my diary (2.) read all the books I own, before reading much else (3.) write Blake (4.) practise Byrd. Saw Beverley Burwell, who looks taller & older & tells me Jerry Riddell has gone to Ottawa for [censored]. He’s pessimistic about the war. Bickersteth’s letters home are mimeographed & circulated & contain many vicious comments about the War Office: full of antiquated crocks hanging on to their salaries & avoiding being pensioned off on various pleas of emergency. He seems to feel that the German account of Dieppe as a foozled invasion attempt was correct: I’m not sure; it’s too symmetical. Of course if it proved only that Canadians are not cowards it didn’t prove much. 1950: A day trip to Salisbury Beach, Mass., with Frye’s U of T colleague, Ruth Jenking. I find the Newburyport turnpike a bit dull, as a road, but Ruth talked easily, she was so relieved to get through with Harvard. The one thing she got from her summer is some understanding of [John C.] Pope’s study of The Rhythm of Beowulf, which, incidentally appeared in 1942, the year of my Music and Poetry article, and if I reprint my essays I may say that this article is a footnote to Pope’s book. Or, in the words of the oracular cliche, I may not. Anyway, the proper way to read Old English is crystal clear to her now, and as it’s a revelation in itself she feels it almost makes up for a very dull summer. This entry was posted in Frye Diaries August on August 27, 2009 by Michael Happy.